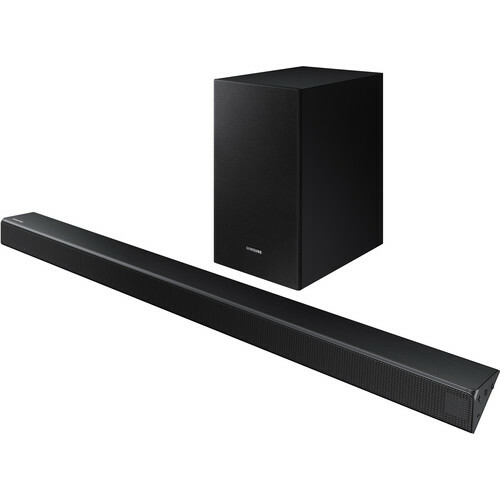 Enjoy wireless audio streaming with the Samsung HW-R550 320W 2.1-Channel Soundbar System. This system delivers up to 160W of power from the soundbar and up to 160W from the included wireless subwoofer. The HDMI input and output let you wire the soundbar between your video source, such as a Blu-ray player or game console, and your TV; the HDMI output supports ARC, so audio originating in TV-based apps can play through the soundbar system. A USB port is onboard for playback of compatible music files, and traditional wired connectivity is achieved via the optical and 1/8" audio inputs. Bluetooth is built into the soundbar for wireless audio streaming from compatible devices like smartphones and tablets. The included wireless subwoofer helps you feel the intensity of the action and the rhythm of the music with rich bass. This sound mode is engineered to automatically analyze the content and optimize the audio. This sound mode is enabled by use with select TVs and is designed to boost game sound effects. Enjoy music from your compatible mobile device wirelessly. 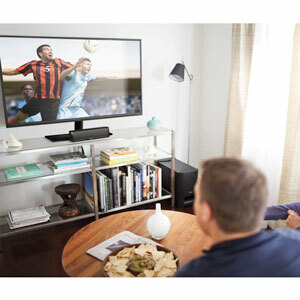 The HW-R550 provides wireless and wired plug-and-play connectivity with select Samsung TVs, allowing you to control both the TV and soundbar with your TV's OneRemote and fine-tune the sound from the TV menu. 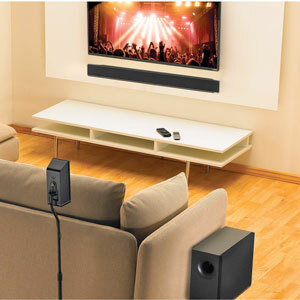 An optional Wireless Surround Kit lets you expand your sound system without signal wires from the soundbar. It works together with the soundbar to create a true surround sound experience. Box Dimensions (LxWxH) 38.0 x 17.5 x 10.0"